The annual Panyard Lenten Crusade presented by the Holy Rosary Parish, began Monday evening at the Massy Trinidad All Stars panyard, where scores of people from the parish, community and the band itself gathered for songs of praise and worship, as well as a homily by visiting Ghanian Deacon Alfred Ofori Yeboah. Before the service, as people were gathering, pannists could have been seen rolling out their pans, microphones were being set up, and chairs were being placed by church ladies, assisted by some members of All Stars headed by their manager Nigel Williams, in the open courtyard to accommodate visitors and parishioners, while quietly in a corner some opted for a game of cards. Another visiting “tanty” congratulated the band declaring them the winner of this year’s Panorama competition despite the official results. Chaplets were also handed out prior to the start of proceedings. 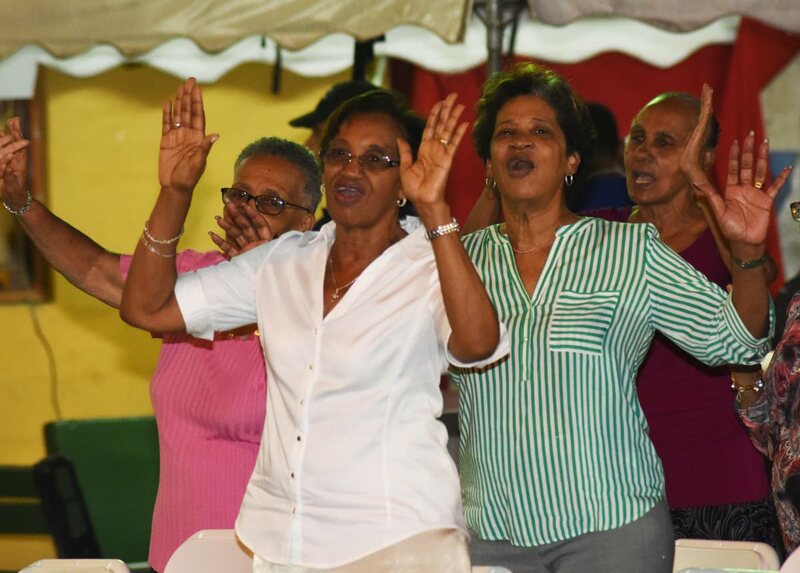 At 6.21 pm, when the event began, the card game immediately ceased and Artherly Nicholas of Grace Ministries led the congregants into the singing of songs of praise and worship. Nicholas ordered that each turn around and tell somebody you love them, before singing Holy Spirit Fill This Room. After declaring God is good, he went on to singing We are Going up Together and I am a Warrior – I am a Conqueror, before asking those gathered to think of themselves as a weapon against the enemy. “Tonight we are not putting clothes in any garbage bag. This is holy ground!” declared Nicholas. Following a quote from Psalm 50, he stated: “In the name of Jesus we have the victory. I don’t know what you came to do but I came to praise God.” He then began singing God is a Good God, Yes, He is. The songs of praise also included I Worship You Right Now Just Because You Are God and You Are God Alone. He then sang a song of a Ghanian lady, “He Jesus can do it Better for You... Hold on to your faith,” before stating that Satan exists in different forms and advised all present to trust in God. “I urge you people to read the word of God with your children and guide them and show them the way to God. What they are now will determine what they will be in the future. The Massy All Stars Youth Band then played Amazing Grace, Let There be Peace on Earth and Madness just prior to the close of proceedings. Reply to "Deacon: TT must surrender to God"